The newly refurbished hotel marries luxury interiors with history and heritage. Perched on the banks of the River Thames, in the heart of London's South Bank, London Marriott Hotel County Hall provides the backdrop for a truly remarkable London experience, surrounded by views of some of London's most prominent landmarks. 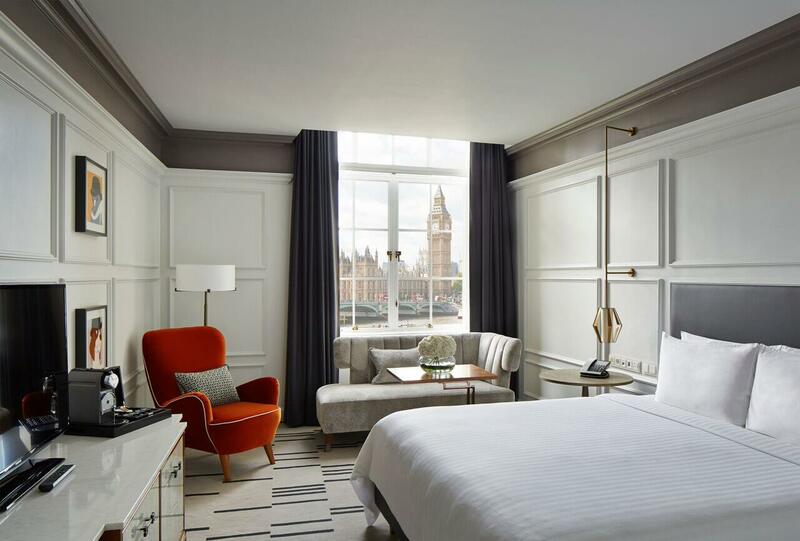 All of the rooms and suites at London Marriott Hotel County Hall have recently undergone extensive renovation, having been refurbished to the highest possible standard. They offer contemporary decor, home-like amenities and incredible views of the Coca-Cola London Eye, the Houses of Parliament and of course, the River Thames. Stay connected with high-speed Internet, rest peacefully on pillowtop bedding, relax in your marble bathroom or order 24-hour room service. Guests at London Marriott Hotel County Hall will also enjoy an indoor 25 metre pool and gym, plus complimentary fitness classes. London Marriott Hotel County Hall will make it easy for you to spend time exploring the city while you're here; in addition to the London Eye and Big Ben, the hotel is just a short walk from Westminster Abbey and - of course - other South Bank landmarks including the Southbank Centre, IWM London and BFI IMAX. Special rates for groups booking 10+ bedrooms. Gillray's Steakhouse & Bar is the most English of English dining destinations, from the interior design to each cut of beef. The bar offers a sophisticated and stylish riverside destination, featuring one of the finest selections of gin in London. The former County Hall Library hosts a delightful afternoon tea, complete with breath-taking views. The London Marriott County Hall is based in the opulent County Hall building which served as the headquarters of local government for 64 years. Afternoon tea is served in the impressive Library Lounge adorned by stone sculptures of heads of state and original book cases that carry out the weight of English History. Enjoy a glass of bubbles in the newly renovated Noe's Champagne Bar, handily located in the entrance of the hotel.